Some of the most common questions we receive here at our ETF Capital Markets help desk are about the best time of day to buy or sell ETFs, so I’ve put together the two key points on this topic. In general, it’s a good idea to avoid buying or selling during the first and last 15 minutes of the trading day. At the start of the trading day, it’s possible, even likely, that some of the underlying stocks within an ETF haven’t started trading. If this is the case, market makers can’t accurately price the ETF and you may end up paying a less-than-ideal price (see “Volume does NOT equal liquidity. Here’s why” for more info on market makers and their role in ETF trading.) At the end of the trading day, some market makers may bow out to try to limit their risk. Fewer market makers in play could limit options and cause bid-ask spreads to widen. 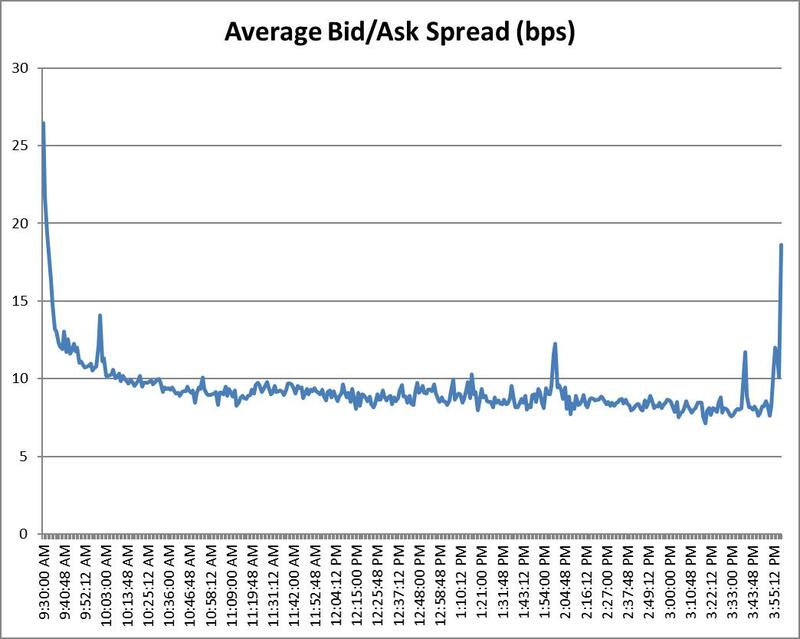 The average bid-ask spread shown above was calculated based on an Invesco Canada ETF and is shown for illustrative purposes only.Source: Bloomberg L.P., from November 1, 2017 to December 31, 2017. Whenever possible, it is preferable to trade international ETFs during the trading hours of the underlying securities. There are two reasons for this. First, trades tend to be executed more smoothly when the related international markets are open. The second, and important reason, is pricing. International ETFs tend to be priced closer to the value of the underlying securities – with a narrower bid-ask spread – when the appropriate markets are open. Trading international ETFs when the underlying market is open is the preferred option, but in many cases, not feasible. 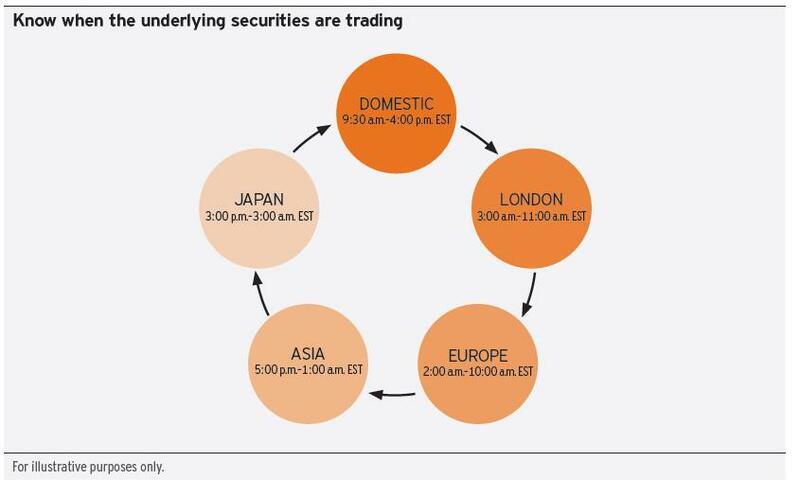 For example, Asian and European markets are generally closed during North American trading hours. Market makers may use alternative methods to price an ETF when the underlying market is closed, such as futures contracts on international markets. This helps keep spreads from widening out significantly. This is the second of three blog posts looking at ETF trading best practices. Read “Volume does NOT equal liquidity. Here’s why” to better understand the role of the market maker, and watch for my next post, where I’ll discuss what to watch for when trading ETFs in volatile markets. Futures contract: An agreement obligating a seller to sell, and a buyer to buy, an asset (such as a commodity or financial instrument) at a predetermined date and price. Futures contracts are used for speculation, hedging and arbitrage, and may be traded themselves before the predetermined date. Futures contracts differ from options, which give a buyer the right — but not the obligation — to purchase an asset. Good article. Perhaps should be considered required reading Yes indeed, I’ve noticed this, in hindsight, much to my own detriment. Your article explains why this is the case. Getting caught up in the trade activity along with the potential realization of an opportunity only to realize that I may have jumped in too early – at the start of the trading day. The market noticeably settles by mid-day providing more optimal opportunity (bid and ask spread) and pricing seems to settle. After all, who among us likes to have one’s profit eroded by “buying high” which I’ve discovered is more likely to occur at the early stages of the trading day. I’ve even posted a note above my screen that reminds me to not even consider buying at the start of the day, and to have patience: all good things can wait! Given the underlying fundamentals, seasonality and business cycle, the quality of the investment choice prevails – and it pays to wait! Thank you. Thank you for your comment Doug. At Invesco we also take a long-term view on investing and believe in the value that an advisor can bring, including setting the asset allocation that is right for each client. Regarding this specific post, we’re not advocating timing the market, but providing guidance on the times of day that tend to be most conducive to effective execution on ETFs.